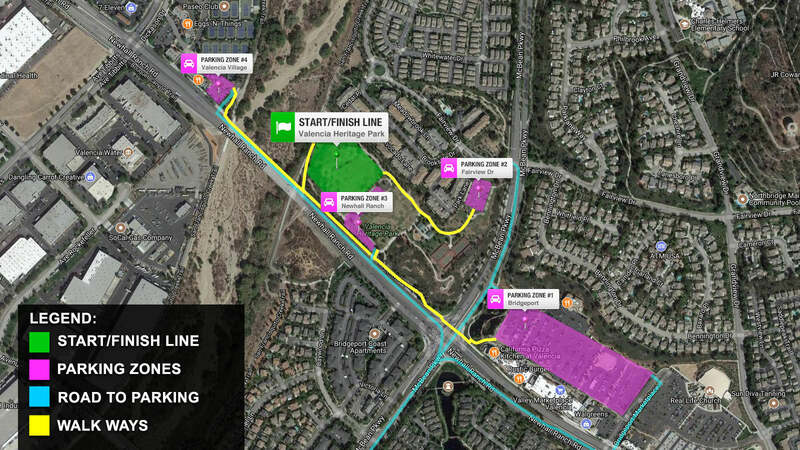 The Arts Run staging area will be on the West field at Valencia Heritage Park, the park is centrally located in Santa Clarita at the cross-section of McBean Parkway and Newhall Ranch Road. Parking within the park is limited, the following parking zones have been designated for the event. We recommend to buddy up and carpool to the race to help ensure there is enough parking. Park at Bridgeport Marketplace on the right or at one the parking zones noted below. Entrance on McBean Parkway or Newhall Ranch Road. The largest parking space for the event, park away from the businesses towards the center. Use the crosswalk to cross McBean and enter the park. Entrance from Fairview Drive. The second parking lot for Valencia Heritage Park offers additional parking space within the East-North end of the park. Walk towards the West field. Good for participant DROP OFF. Entrance from Newhall Ranch Road to Valencia Heritage Park, space is very LIMITED and is not recommended unless arriving extra early. Good for participant DROP OFF. Entrance on Newhall Ranch Road. Last resort for parking in the Valencia Village by the Paseo Club once all other parking options have filled up. To ensure there is enough parking, we encourage everyone to carpool to the race. If you are running with friends or family then buddy up and ride in one car to the race. The two Valencia Heritage Park parking lots have easy turnarounds that are great for dropping off participants, but limited parking, if you can be dropped off in the morning and be picked up after the race that would be very helpful. For your safety, when parking in the Zone #1 at Bridgeport Marketplace use the crosswalk at McBean Parkway and Newhall Ranch Road to cross the street, DO NOT jaywalk, then use sidewalks to access Valencia Heritage Park. Do not block any driveways, businesses, or cars, do not park outside of designated parking zones, cars will be towed. Lock your car and do not leave any valuables visible. We are not responsible for lost or stolen items. Please note that race information here represents what is planned for the Santa Clarita Arts Run. Locations, course variations, parking, and changes may apply depending on conditions, availability, and improvements. We strive to make the best experience for the runners. Thank you for your understanding.